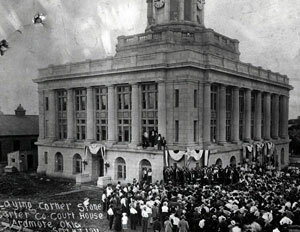 As the Carter County seat, Ardmore is the largest metropolitan area in southern Oklahoma and a vital commercial center. Development of Ardmore’s downtown owes much to the Gulf, Colorado and Santa Fe Railway line from Texas to Kansas, completed in 1887, and subsequent routes from the Arkansas and Choctaw, and the Western Oklahoma railways. These railroads made Ardmore a shipping and trading center for agricultural products and helped to accelerate settlement and development. 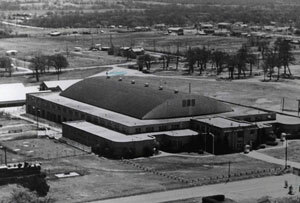 Ardmore’s active business center was mostly composed of wood frame buildings, and the resulting fire hazards were a matter of great concern. Unfortunately, in 1895 most of the downtown area was destroyed by a fire that started on North Caddo. The fire spread rapidly and destroyed much of what is now East Main Street. Ardmore quickly cleaned up the debris and rebuilt its businesses in masonry structures. 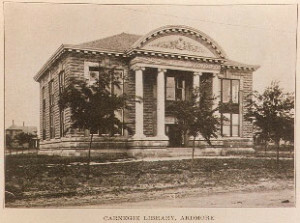 In 1897, Ardmore became incorporated as a city and rapidly added many municipal improvements to its list of accomplishments. From 1910 to 1920, a period of active oil exploration brought increased prosperity and development. The District consists of a group of 121 mostly masonry commercial buildings located on the north side of Hinkle Street and the north and south frontage of Main Street between “C” Street on the west and the Santa Fe Railway right-of-way six blocks to the east; on Washington Street from Main to 2nd Ave. NE; on Caddo Street from Main to one-half block north of 2nd Ave. NE; and buildings on the “A” Street frontage on the east side of the street between Main and Broadway. Many of the District’s buildings are the result of a large scale rebuilding effort that took place after a gas tank car explosion in 1915 that destroyed much of what was originally built in the area. 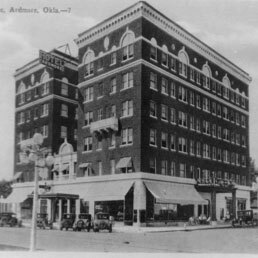 Ardmore’s prosperity enabled businesses to rebuild quickly with buildings that were often larger and more ornate than what was typical for Oklahoma at the time. More recently, significant resources have been devoted to facade renovations, building rehabilitations, and streetscape improvements in the District. Community investment in the area underscores the importance of the District to the City of Ardmore. Consequently, preservation of the District’s historic resources is of primary importance. The Ardmore Downtown Historic Business District is a unique and attractive commercial area due to the integrity of its historic resources and the efforts of its citizens, government, and public and private institutions to protect its historic resources. The District is a symbol of Ardmore’s vibrant past, and it continues to be a lively and successful commercial area. Click the map to view a large version of the Ardmore Historic District. Main Street from Santa Fe RR tracks to “B” Street NW; N. Washington from Main to 2nd Avenue NE; Caddo from Main to 2nd Avenue NE.